As one of the first female umpires in the minors, Margie puts up with insults and worse from people who think women don’t belong inbaseball. Forget making history—Margie just wants to do her job and be part of the game she loves. Tim filled the doorway of Margie’s bedroom, duffel bag over his right shoulder. She glared at her twin brother’s blond surfer-dude hair and pretty face, marred only by a twitch in his jaw. Thanks to a few carefully picked arguments over the last few days, she’d caused that tension and, until that moment, had been proud of her handiwork. Margie returned to the book she’d been pretending to read. She felt guilty for being so mean to him lately, but she’d had her reasons. The highlight of baseball camp was the major league tryouts. He’d signed up and, sixteen and male, met all the requirements. No doubt some scout would notice his killer fastball and draft him, and then it would be sayonara, sister. Maybe it would be easier to say goodbye if she was good and pissed at him. He looked like a dumbass standing there, mouth gaping, hoping she’d change her mind. “Never mind. See you on your baseball card.” But despite their mother’s squawking that they had to get on the road, the shadow in her doorway didn’t budge. Margie glanced up—big mistake. He had that same sad, lost look on his face when they were five and Mom took his favorite blankie and put it in the washer. It always undid her, and he knew it, so when she tossed her book aside and got off the bed, he grinned. He rolled his eyes but, as she grabbed her baseball cap and followed him to the car, transferred the strap to his left shoulder. Scattered across the sparkly outfield grass, teenage boys stretched, took practice swings, shagged flies. Men with clipboards circulated among them. Families and friends had been banished to the bleachers, where Margie and her mother sat bathed in Coppertone and drinking cans of almost-cold soda. Her mother was jabbering her ear off about what “they” were looking for in a young pitcher, as if she had a direct pipeline to Major League Baseball’s scouting strategies. Then she mused about the all-you-can-eat buffet they’d passed in the dining hall on their quick tour of the complex. Her mother went off on the buffet. That of course they couldn’t judge the quality of the food from what the college would be serving for lunch; they probably put out their best for the families, and once she and Margie left Tim there, who knew what slop her golden boy would be forced to endure? Margie had once seen Tim eat a two-day-old sandwich he’d left in his locker in junior high school, and he’d been fine, so she wasn’t worried about that. What concerned her was Tim himself. He didn’t look good. His shoulders slumped forward; his gaze darted like he was searching for something familiar to ground him. She mumbled excuse-mes to a variety of parents and trotted down the concrete steps to the field, tucking her blond ponytail into her ball cap on the way. Nobody stopped her. In her jeans and baggy Saugerties Sawyers T-shirt, she could have passed for a boy if nobody looked too closely. She grabbed a catcher’s mitt from a pile of equipment and kept walking toward him. He grinned when he spied her pounding her fist into the pocket, but his expression faded, as if afraid she’d be arrested any moment and dragged away to an imagined gulag deep in the bowels of the college’s athletic department. She’d never been on the field of a stadium that big before. Settling in was tough, with all the chaos around them, the smack-talking boys and the barks of the coaches, the cheers from the stands. 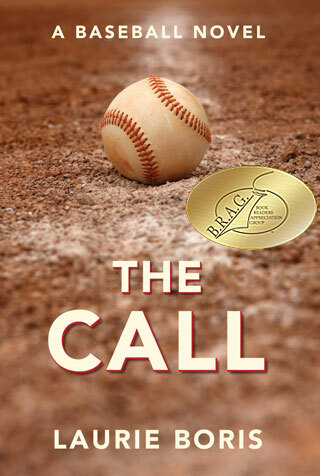 Soon they fell into their regular rhythm—him setting, winding up, and pitching; her winging it back and crouching for another one. As easy as if they were in the backyard on a summer evening. The guy waiting with his glove out was smirky and acne-scarred, the vibe of entitlement as obvious as his Rod Stewart haircut and the gold chains around his neck. Margie scooped up the ball and powered it back to him, a clean strike. The guy caught it but stood there for a second, looking stunned. She might have apologized to Tim for a return that hard, but not to this guy. “Oblonsky,” both twins said at once. Tim mumbled a few words—they were twins, paperwork went missing, late entry—but his excuses weren’t smooth enough or fast enough. Margie already saw recognition dawning in the man’s narrowing eyes, his tightening lips.